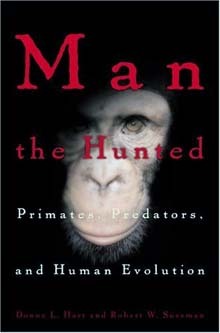 Sussman’s book, “Man the Hunted: Primates, Predators and Human Evolution,” poses a new theory, based on the fossil record and living primate species, that primates have been prey for millions of years, a fact that greatly influenced the evolution of early man. ”Australopithecus afarensis was probably quite strong, like a small ape,” Sussman says. Adults ranged from around 3 to 5 feet and they weighed 60-100 pounds. They were basically smallish bipedal primates. Their teeth were relatively small, very much like modern humans, and they were fruit and nut eaters.